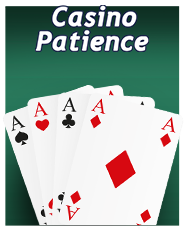 The game rules patience are easy to understand and you can immediately start playing this card game at the Oranje Casino. You are only dependent on the cards you receive when playing, and therefore only play yourself and not against a dealer or against other players. After going through the rules of patience, you can first practice for free at the Oranje Casino and then start gambling with real money. 52 playing cards are used for the game and the goal is to get four rows of consecutive cards from the ace. All cards have to be put on the pile and you have finished the game. The game starts with seven rows, with 28 cards divided into a row with one card, row with two cards, row with three cards, row with four cards up to the seventh row with seven cards. The top card of the stack is turned over so that it is visible. The remaining cards consist of a pile, of which you always draw a card. If an ace becomes available, you must place it above the tableau with the row of cards. All cards of the same type and color may then be placed from low to high in a consecutive manner. If a card is played on an ace, it can not be removed. On the tableau are the cards that are played in descending order. When playing cards on the tableau of the seven rows, every card that has been turned over or changed places must remain visible. The moment a row is played, the opportunity is offered to move a visible king in the tableau to an empty row. 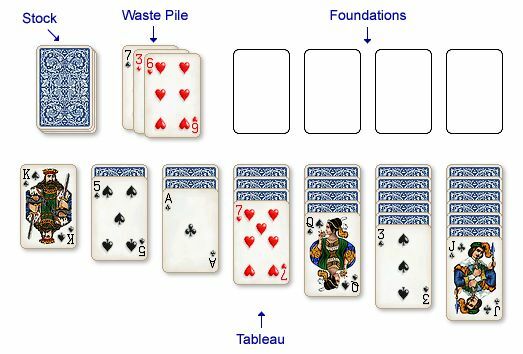 The cards of the remaining pile must be turned over, so that they can be stored one by one in a row as well as possible or placed in a row with aces. If that does not work, then there is a non-playable card and the next card is taken. If all four rows from the ace are placed in order in the same suit, then according to the game rules of patience, the game is played out. There are a number of tips and strategies to apply. In this way you use the game rules o patience optimally. The tactic is to first determine the priority. That is, of course, moving the cards to the columns. Only use the stack of unused cards if no other option is possible. Another tip is to first use the cards in the longest column. If you do not do that then you have the chance to run into a problem at a later time. It is also advisable to fill the four places that are open in an even way with matching cards. It is of course advisable to find your own way in playing solitaire in Oranje Casino. Are you a beginner? Then it is useful to know that a king does not fit an ace. The ace is the lowest card. For example, it is possible to place a red farmer under a black woman. Or a black 3 to place under a red 4. The game is well closed at the moment that all cards have been given a spot on the aces. Also start with a low bet if you are a beginner. Or first play a game of trial. That is free in Oranje Casino and then you get the hang of it. It is interesting to try out some strategies when playing solitaire in Oranje Casino. One of the strategies to be applied is called Deuce Protection. This system aims to protect the two. You do that by moving the three to an ace as long as possible. The chance that there will be another two is even greater. This system is no longer applicable when the two are put away. Next Card Protection is another tactic. That is that you get the opportunity to put away a lot of cards in one go. In this case, you only discard the card with the idea that there is a place to put away the lowest card. It must then be released. The 5-6-7-8 block is another strategy. This system provides that you do not put 5, 6, 7 or 8 away while playing solitaire. There is one exception to this. That is when the card can be put away in such a way that there is a consecutive card in the column. The solitaire rules can be optimally used. It is possible to try out the systems for free. It is also an trustly game to play along the way. Or if you have to wait for a short or a long time. This solitaire game can also be played in the mobile casino of Oranje Casino. To play the fun game for money, you must have an account. That is the only option to deposit money and gamble for money.